The ALT test measures the ALT blood level. The ALT blood test measures the ALT blood level. Why is an ALT blood test important? The ALT test helps screen for liver problems. This ALT Test is a blood test. The ALT test, also known as an ALT lab test, alanine transaminase test, and alanine aminotransferase level test, measures the ALT blood level. The ALT test is a common lab test to help evaluate the health of the liver. Previously known as a serum glutamic-pyruvic transaminase (SGPT), ALT is an enzyme that helps process the amino acid, alanine. ALT blood levels can be elevated in a number of liver-related conditions, including bile duct damage and viral infections. High ALT levels may also be seen in other conditions such as mono and muscle damage. The ALT is sometimes measured with its counterpart, the AST test to calculate the ALT / AST ratio. This ratio may help with refining the possible causes for a high ALT blood test result. Because the ALT is a standard lab test, getting an ALT test near you at a local lab is a relatively simple process. After ordering online and getting your blood drawn at Quest Diagnostics lab, your ALT lab results will be electronically available. As can be seen on the ALT sample lab report above, ALT blood levels are reported as a number in U/L units. 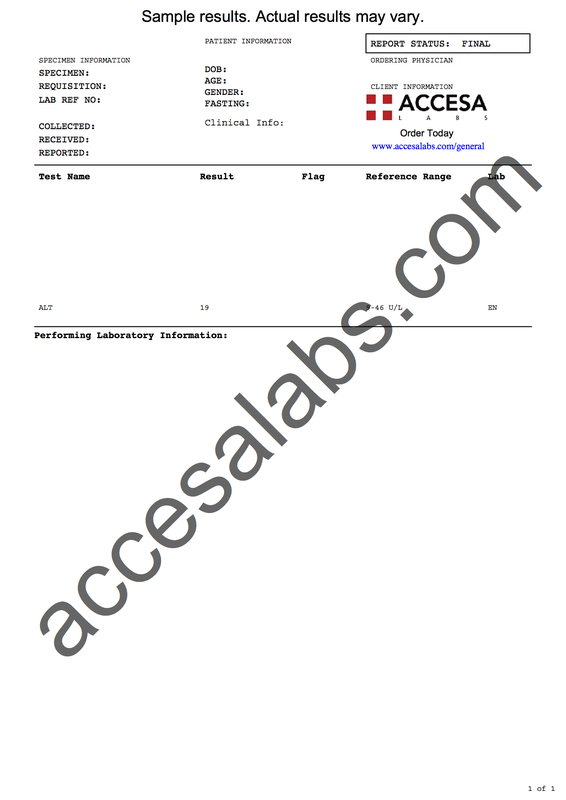 This ALT lab test is a component of the LFT blood test panel. ALT Test at Guaranteed Prices.